Edit your profile so that your suffix contains the letters “CMI®” without the quotation marks. Only do this if you are a Certified Master Inspector® . Don’t forget to scroll to the bottom of that page and click on the Submit Changesbutton. Go here: www.nachi.org/sampleid and order your free photo ID. You’ll have to upload a photo of yourself. 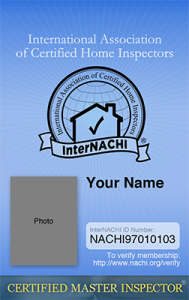 Your free Certified Master Inspector® photo ID will arrive in about 30 days. It will likely come in an envelope along with other literature, so make sure you look for it. More ways to use your Certified Master Inspector®professional designation to give your inspection business a huge boost.